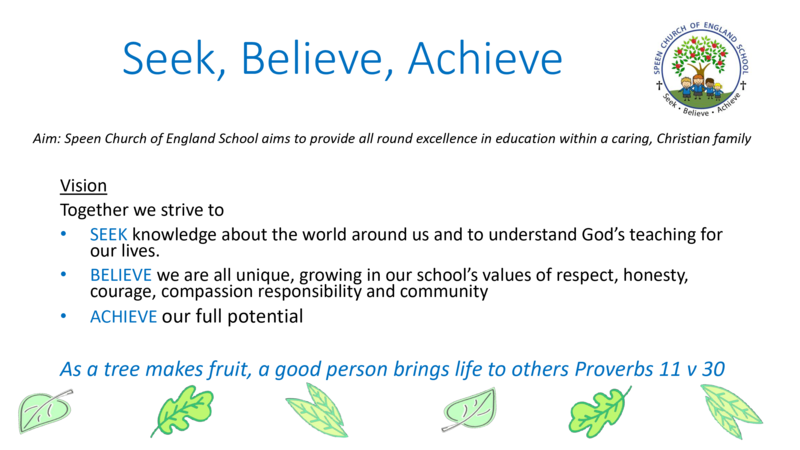 This is the Governors’ policy on School uniform and by accepting a place at Speen School you are agreeing to abide by this code. The school colours are royal blue and grey. All items of school clothing, including shoes and socks must be clearly marked with your child’s name. It is of prime importance that all children are able to dress themselves before they attend School including putting on and taking off shoes. Boys: White long sleeved shirt, grey shorts or trousers, school tie (years 1 and 2), royal blue v-necked jumper, grey socks. Girls: White collared shirt, grey skirt, pinafore dress or tailored grey trousers, school tie (years 1 and 2), royal blue v-necked jumper or cardigan. Long plain white socks or royal blue or grey tights. Winter coats: Navy blue coats or anoraks are preferred. Boys: Plain white short-sleeved shirt, grey shorts and grey socks. Girls: Pale blue and white check dresses, short white socks and sandals. All pupils should wear black school shoes and they also need black plimsolls. Separate indoor footwear is not needed. Boys and Girls: Royal blue shorts, round necked white t-shirt, black plimsolls, royal blue tracksuit. A Speen School book bag and a shoe bag, both named, are practical. No responsibility is taken for watches and no items of jewellery including earrings may be worn. Long hair should be tied back and kept neat for safety in practical activities. Children are required to bring a named hand towel with a loop for use in the cloakroom. Speen School hats for both winter and summer are available, as all uniform above (with the exception of socks) from Different Class. Order forms are kept in the Reception class cloakroom. To order uniform from our approved supplier, please follow the link below and use the supplied username and password to log in. Full instructions and further information are available here. Paper copies of information contained on our website are available free of charge from the school office.